This is a handwritten letter from Eugene Guagneli to his mother, Luisa Guagneli, while she was interned at Kingston Penitentiary during WWII. The letter is dated February 23, 1941. It is written with blue ink on lined loose-leaf paper. 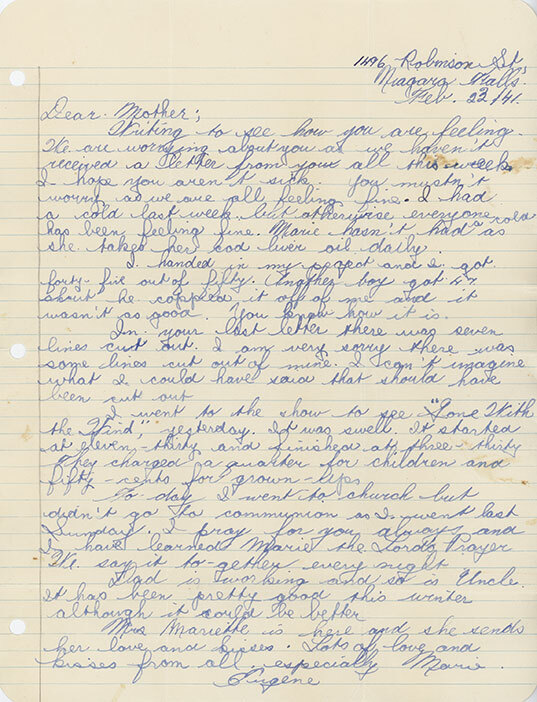 In this letter, Eugene tells his mother that the family is worried because they haven't heard from her in weeks. He assures her that everyone is fine back home, including his younger sister Marie "who takes her cod liver oil daily." He talks about going to the movies to see Gone with the Wind and about his project at school which he received 45 out of 50. He also writes, "Today, I went to church ... I pray for you always and I have taught Marie the Lord's Prayer. We say it together every night." Mail correspondence between internees and their families underwent a censorship procedure by the Internment Camps. In fact, Eugene writes in this very letter: "In your last letter there were seven lines cut out. I am very sorry there were some lines cut out of mine. I can't imagine what I could have said that should have been cut out."